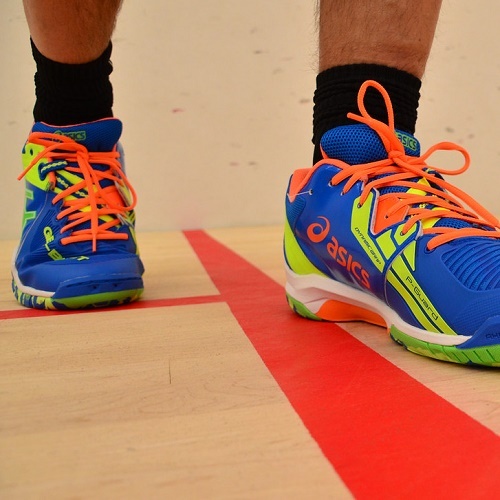 Whether you’ve recently started on your squash journey or if you’re a long-time player, it is important to make sure that you are wearing appropriate footwear on the squash court. The right pair of shoes can definitely make your squash match better, help prevent pain and reduce the risk of injury. The best way to determine what type of shoe you need is by looking at the size of your foot arch (either low, high or standard). This controls the way you place your foot when you walk. The easiest way to find out is by doing a footprint test. Wet your foot, step on a piece of paper and trace your footprint. Another way is to simply look at the sole of an old pair of shoes and see where the tread has worn away the most. If your test shows only a portion of your forefoot and heel with a narrow imprint on the outer edge of your foot, you have high arches and tend to under-pronate. This means you roll your foot outwards away from your knee which puts pressure on the outer edge of the heel and little toe. The best shoe for you is a cushioned shoe with a soft midsole to encourage your foot to move towards the centre. If your test shows the entire sole of your foot with little to no curve on the inside, you have low arches and tend to over-pronate. This means your feet roll inwards which creates pressure on the outside heel and inside of your foot. The best shoe for you is one that has maximum support to balance out the centre of the foot. If your test shows a distinct curve along the inside of your foot it means you have a natural arch and you wear your shoes evenly. The best shoe for you is a pair that has a good combination of cushioning with support to keep the tread even. It is important for your shoes to feel comfortable right way so don’t wait for them to fit better or stretch after some wear. They should fit relatively snug and secure, not too tight across the top of your foot and you should be able to wriggle your toes comfortably. Try shoes on while wearing the types of sock you normally would, as well as any orthotics, to get the perfect fit. When the shoes start to feel uncomfortable, the back of the sole is worn out, or you start experiencing pain in your knees, ankles or shins – replace them. Towards the end of the day is the best time to shop. Your feet will swell during the day and expand further during exercise so try on shoes when your feet are at their largest. Getting new shoes can be expensive and there are plenty of options on offer. While it is important to invest in a good pair of shoes – since you’ll be on court all the time – you don’t have to spend top dollar. Instead get the best fit for your foot. Your feet will thank you for it.